Inside the empty sitting room of the old-fashioned red-roofed bungalow are two pictures of APJ Abdul Kalam, with some rose petals on a table in front. A small stack of books in front of an austere metal chair, the way he left them the last time he was in this room, the silhouette of a veena covered with a green cloth, unassuming like the man himself, and bookshelves lining the four walls — there is nothing about the room that suggests it will never be used again. Except the small lock with the Delhi Police seal. This is the 10, Rajaji Marg residence of former President A P J Abdul Kalam. 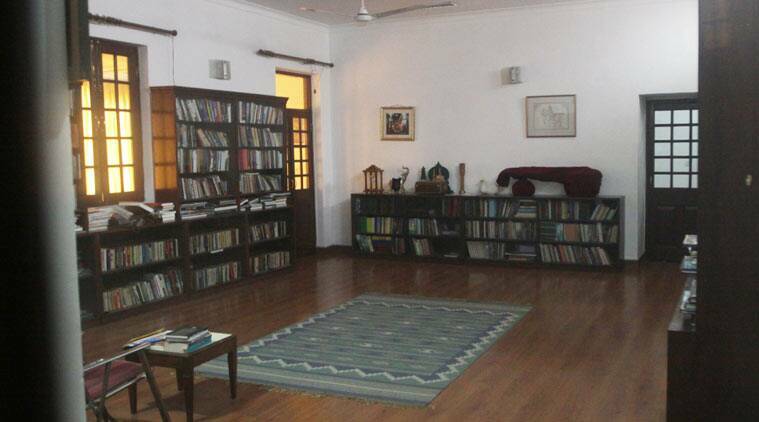 The 30 feet X 30 feet library is where Kalam would sit with his books, prepare for lectures, and on “special” days, play the veena sitting on a rug on the floor. His bedroom attached to the library is locked too. That too has books — and some clothes. Inside the empty sitting room of the old-fashioned red-roofed bungalow are two pictures of Kalam, with some rose petals on a table in front. The staff are in the process of winding up, making calls to cancel Kalam’s packed schedule for the rest of the year. “We had appointments till January 4 next year,” said Kalam’s private secretary R S Prasad. This was typical of the enthusiasm and energy of the man who cut short his last trip to IIM-Shillong by a day because he thought the original schedule that required him to rest after arrival was too relaxed. “He insisted on giving a lecture in the evening, immediately after making the air trip to Guwahati and then the four-hour road trip,” said his executive secretary, H Sheridon. Kalam collapsed minutes into that lecture. Sheridon, who was with Kalam for the last 24 years, still talks about the former President in the present tense. “He is never like a boss. He never commands… always says ‘will you do this for me’. When we travel, he tells the restaurant staff, ‘this man is non-vegetarian, do you have something for him?’ When my food does not arrive, he asks, “why hasn’t your funny stuff arrived’,” he recalled. “I will miss his love,” he added. One of his assistants who accompanied Kalam on the last trip to Shillong recalled his first greeting on the flight. “He said, ‘where were you funny guy, haven’t seen you in a week’. I said I had gone to Mumbai for a kirtan. He told me, ‘you think your sins are washed? Go to Rameswaram, you will be pure.’ I did go there two days later but when I came back, he was not with me,” he said. Sheridon said that as President, Kalam would insist on paying for his meals at Rashtrapati Bhavan as well as the toiletries he used. “In 1993, when my bike was stolen, he would take me in his car from South Block, drop me at Mandir Marg and then go home to Asiad Village. And he would never let me sit in the front,” he said. Always a man in a hurry, Kalam was, of late even more so. “He wanted to give a presentation to UP government on the development of the state. We told him let’s do this after summer. He said ‘no, you don’t know time is running out’. He gave the presentation on May 12. Maybe he had a premonition,” said Prasad.